Our goal is to exceed your expectations the first time, every time. Our highly knowledgeable customer process engineering team has extensive experience in manufacturing precision metal parts. Our team excels in providing our customers with unparalleled value-added technical expertise and support. From the early stages of design, through the many engineering changes that often occur during the development stages of a project to final volume production the team is dedicated to provide you with exceptional quality, value and service. Combining Dynamic Design & Manufacturing's development experience, manufacturing design expertise and wide range of capabilities uniquely positions Dynamic Design & Manufacturing to be your source for high quality precision sheet metal, machined parts and assemblies. 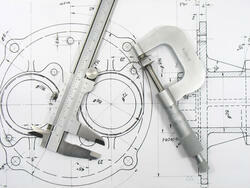 We can accommodate most electronic file formats including DXF, DWG, IGES, STEP, X_T, and SLDPRT. View our recommended standard linear tolerances for sheet metal parts. View our recommended positional tolerances for sheet metal parts.